Today I am thankful for lively debates. I enjoy it when people intelligently and passionately discuss various subjects with fervor and focus. There is something thrilling, magnetic, and electric that draws the audience into full-bodied discussions that are navigated with ease, respect, and creativity. Now, I must point out the difference between this and arguing. Arguing, save for the form that it takes in the legal profession, typically consists of a series of thoughts and accusations being hurled at another person like huge misguided javelins, which, due to a lack of focus, rarely ever make the desired impact with the intended target. That observation might get under the skin of some people, but when you really let that idea sink in and you give it some thought, you will probably see what I mean. Why exactly are arguments generally that way? It’s because in reality the people having the arguments are not nearly as much in control of what is said and how it is said as their emotions are. 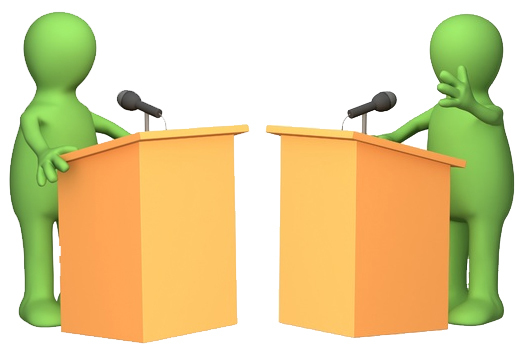 Yet, when mature and focused individuals jump into an impassioned debate they tend to be more in control of what is said and done than their emotions are, and that balance and control of emotions – something that is not often accomplished by most people – is what ultimately draws us all into that verbal competition among the gladiators of our time.